This spring, awaken the senses and let your palate warm to the delicate, nourishing flavours on offer at Ming Court, Langham Place, Guangzhou. Bird nest delicacies as well as set menus are packed with rich nourishment and bountiful protein for guests to enjoy. Menu highlights include Braised Bird’s Nest and Scallops with Corn Sauce and Spinach Sauce, Stewed Birld’s Nest with Crab Meat and Crab Roe, Luxury Bird’s Nest with Abalone and Sea Cucumber Set Menu. Bird’s nest delicacy and set menu are served daily during lunch and dinner from February 1, 2018 until April 30, 2018. Bird nest dishes staring at RMB168, purchase two orders of bird nest dish from a la carte menu to receive one complimentary order. 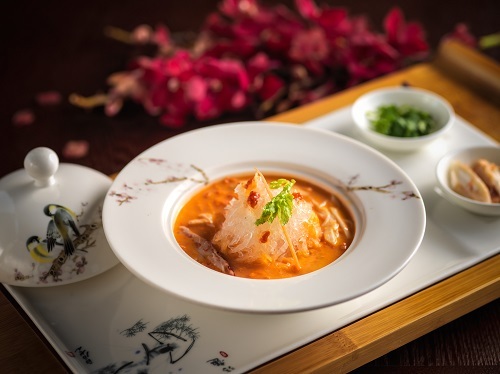 Bird Nest, Abalone and Sea Cucumber Set Menu is priced at RMB488 per person, with complimentary Chinese petit fours and fresh fruit, a cup of exquisite Chinese Tea or one glass of Langham house wine per set menu. For enquiries or reservations, please contact us at +86 (0)20 8916 3588.